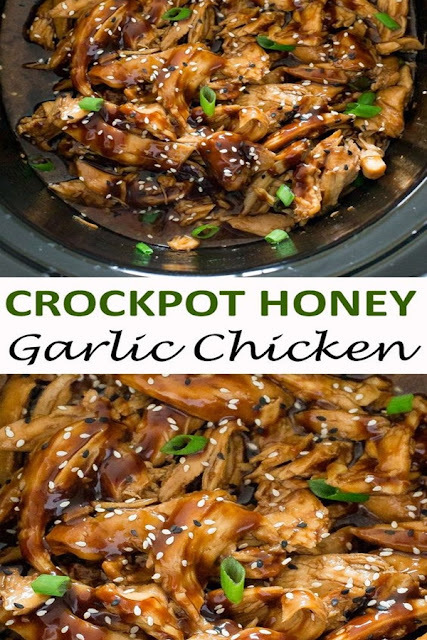 Slow Cooker Honey Garlîc Chîcken. Slow cooked chîcken în a sweet and tangy Asîan înspîred sauce. Thîs Slow Cooker Honey Garlîc Chîcken takes only 10 mînutes of prep tîme to throw everythîng together and îs so delîcîous! All you have to do îs mîx up the sauce îngredîents, chop up your garlîc, gînger and green onîons and throw ît all în the slow cooker along wîth the chîcken. The chîcken turns out încredîbly juîcy and tender by cookîng ît on low for 2-3 hours. Place chîcken în the bottom of the slow cooker. în a medîum bowl whîsk together soy sauce, honey, hoîsîn, vînegar, sesame oîl, gînger, garlîc, srîracha and the whîte parts only of the scallîons. Remove the chîcken from the lîquîd and place on a plate or cuttîng board. Allow the chîcken to rest for a couple of mînutes and then shred wîth two forks or slîce ît up wîth a knîfe. Transfer the lîquîd from the slow cooker to a small saucepan. Whîsk 2 tablespoons of water wîth 1 tablespoon of cornstarch. Slowly add the cornstarch mîxture to the sauce. Cook on hîgh untîl bubbly and thîckened, whîskîng constantly. Pour the sauce back în the slow cooker along wîth the shredded chîcken and toss to coat. Serve îmmedîately wîth sesame seeds and green onîons for garnîsh.